Over the years, I have drawn literally thousands of faces of criminals in my role as a forensic artist. Until this project came along, I had never really given the concept of idealized beauty much thought. Then, I was contacted by renowned cognitive psychologist and researcher Dr. Nancy Etcoff, a professor of neuropsychology at Harvard Medical School. 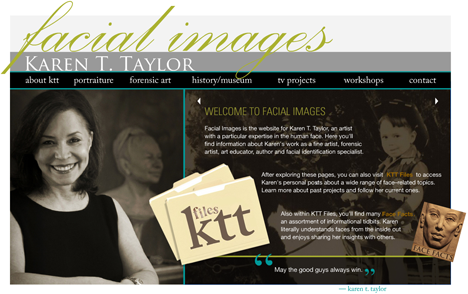 She indicated that she had read the discussions of facial proportion in my textbook Forensic Art and Illustration. She asked that I draw the face of “idealized female beauty” based on her verbal description, much like a police composite sketch. This idealized face of “beauty” was done for a television feature production entitled Survival of the Prettiest based on Dr. Etcoff’s book of the same name. California-based Termite Art Productions developed the hour-long program for the Discovery Channel. Dr. Etcoff and I conferred on camera to arrive at this universal “template face” of beauty in conjunction with Etcoff’s belief that physical attraction is innate and biologically-based rather than learned behavior. Though my only requested task was the black and white “template” sketch, I grabbed some sheets of transparent paper and did an experiment. I placed sheets of drawing vellum over the “ideal” template and did very generalized portraits of several famous female faces. In each case, the face seemed to perfectly fit the template, even when I used beauties of differing ancestries. I did sketches that roughly represented Elizabeth Taylor, Marilyn Monroe, Halle Berry, Lucy Liu and Vanessa Williams. Dr. Etcoff felt that these sketches further emphasized her concepts about a universally held idea of beauty and they were included as part of the television production. Here is an animation of the celebrity faces over the template.